Home > Lawn and Garden > Lawn Mower Idler Pulleys > MTD Idler Pulleys - Fits also Ariens, Canadiana, Hahn, Noma, Toro... > 280-081, FLAT IDLER PULLEY for MTD 756-0240 and others including select Snowthrowers. 280-081, Lawn Mower FLAT IDLER PULLEY for MTD 756-0240 and others listed below. 280-081, FLAT IDLER PULLEY for MTD 756-0240 and others including select Snowthrowers. 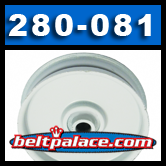 280-081, 3/8” Bore FLAT IDLER PULLEY for MTD 756-0240 also replaces: ARIENS 07312700, CANADIANA 51448, HAHN 27880, HAHN 451293, MTD 756-0240, NOMA 313850, NOMA 51448, TORO 112426, TORO 2-4463, TORO 7434. MTD Snowthrowers 840, 841, 850, 960 (1987-88) series. We offer 100% Secure Shopping!